If you thought Luke Skywalker’s home planet, Tatooine, was a strange world with its two suns in the sky, imagine this: a planet with either constant daylight or triple sunrises and sunsets each day depending on the seasons (which last longer than human lifetimes). Such a world has been discovered by a team of astronomers led by the University of Arizona using direct imaging. The planet, HD 131399Ab, is unlike any other known world – one with, by far, the widest known orbit within a multi-star system. The discovery will be published in an early online edition of the journal Science on July 7. Located about 340 light years from Earth in the constellation Centaurus, HD 131399Ab is believed to be about 16 million years old, making it one of the youngest exoplanets discovered to date. With a temperature of 850 kelvins (about 1,070 F or 580 C) and weighing in at an estimated four Jupiter masses, it is also one of the coldest and least massive directly-imaged exoplanets. 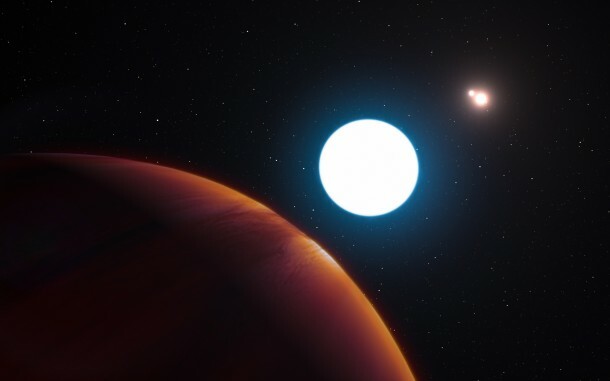 “HD 131399Ab is one of the few exoplanets that have been directly imaged, and it’s the first one in such an interesting dynamical configuration,” said Daniel Apai, an assistant professor of Astronomy and Planetary Sciences at the University of Arizona. He is the principal investigator of one of NASA’s teams in the Nexus for Exoplanet System Science (NExSS), which is an interdisciplinary network dedicated to the search for life on planets outside our solar system. The planet marks the first discovery of an exoplanet made with SPHERE, which stands for the Spectro-Polarimetric High-Contrast Exoplanet Research Instrument. It is installed on the Very Large Telescope operated by the European Southern Observatory on Cerro Paranal in the Atacama Desert of northern Chile, and dedicated to finding planets around other stars. SPHERE is sensitive to infrared light, making it capable of detecting the heat signatures of young planets, along with sophisticated features correcting for atmospheric disturbances and blocking out the otherwise blinding light of their host stars. Although repeated and long-term observations will be needed to precisely determine the planet’s trajectory among its host stars, observations and simulations seem to suggest the following scenario: At the center of the system lies a star estimated to be 80 percent more massive than the sun and dubbed HD 131399A, which itself is orbited by the two remaining stars, B and C, at about 300 AU (one AU, or astronomical unit, equals the average distance between Earth and the sun). All the while, B and C twirl around each other like a spinning dumbbell, separated by a distance roughly equal to that between our sun and Saturn. In this scenario, planet HD 131399Ab travels around the central star, A, in an orbit about twice as large as Pluto’s if compared to our solar system, and brings the planet to about one-third of the separation of the stars themselves. The authors point out that a range of orbital scenarios is possible, and the verdict on long-term stability of the system will have to wait for planned follow-up observations that will better constrain the planet’s orbit. Planets in multi-star systems are of special interest to astronomers and planetary scientists because they provide an example of how planet formation functions in these extreme scenarios. While multi-star systems seem exotic to us in our orbit around our solitary star – multi-star systems are in fact just as common as single stars. NExSS is a NASA-led research coordination network dedicated to the study of planetary habitability by bringing together researchers from different fields. NExSS aims to build an international community of interdisciplinary researchers, including those supported by other agencies, dedicated to exoplanet research through NASA investments. This network will explore the diversity of exoplanets and to learn how their history, geology and climate interact to create the conditions for life. NExSS investigators also strive to put planets into an architectural context – as solar systems built over the eons through dynamical processes and sculpted by stars. Based on our understanding of our own solar system and habitable planet Earth, researchers in the network aim to identify where habitable niches are most likely to occur, which planets are most likely to be habitable. NExSS will accelerate the discovery and characterization of other potentially life-bearing worlds in the galaxy. The co-authors on the paper are Markus Kasper and Melissa McClure of the European Southern Observatory in Garching, Germany; Kaitlin Kratter at the UA’s Steward Observatory; Massimo Roberto at the Space Telescope Science Institute in Baltimore; and Jean-Luc Beuzit with the University of Grenoble Alpes and the National Center of Scientific Research, both in Grenoble, France.